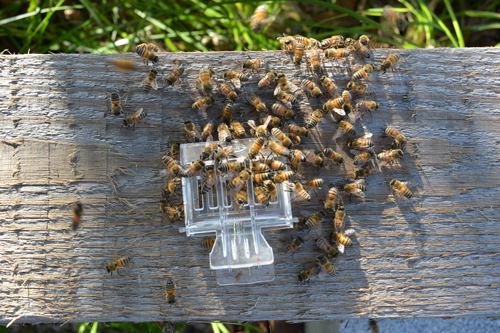 Lately we have become very familiar with a particular behavior bees tend to do – swarming. 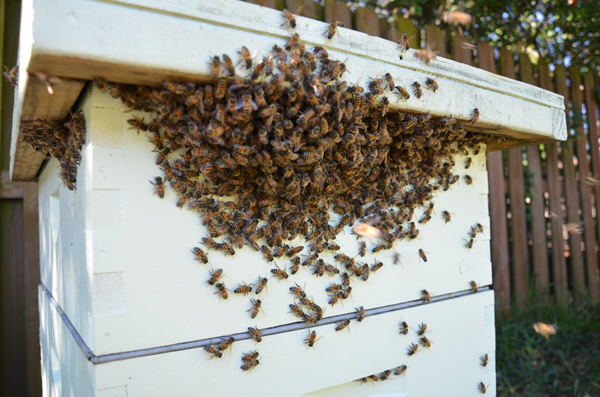 For those of you who don’t know, swarming is when the queen bee decides to leave the hive in search of a new home along with about half the population of bees. 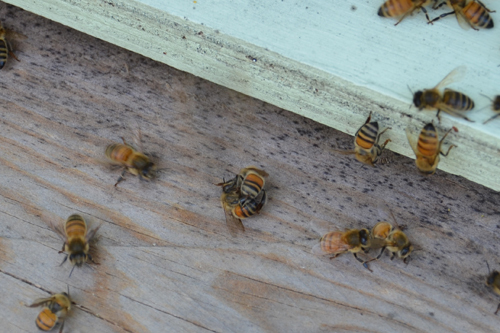 We noticed a lot of activity going on in front of the hive early in the morning. It looked similar to orientation flights that usually occur during the afternoon hours. We thought it was a bit odd, but kept on with our day. 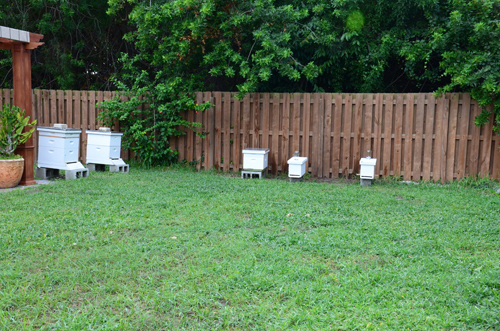 A few hours later my husband, Yanni, went out to check the bees and realized they had swarmed. 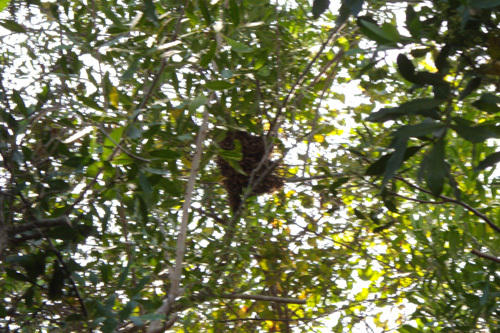 There was a nice big ball of bees about 20 ft. up in a Brazilian Pepper tree. 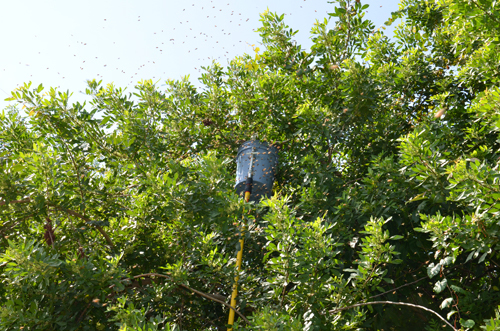 This was going to be our very first attempt at catching a swarm, and boy did we learn a few things. 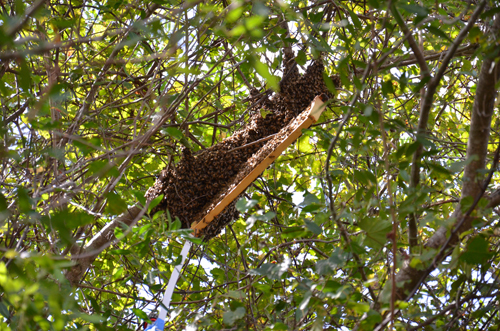 At first Yanni tied a frame to a long stick and put it up next to the swarm with hopes that they would climb on to the frame and we could bring them down. That didn’t quite go as planned. So with the help of a friend, Yanni created a swarm catcher. 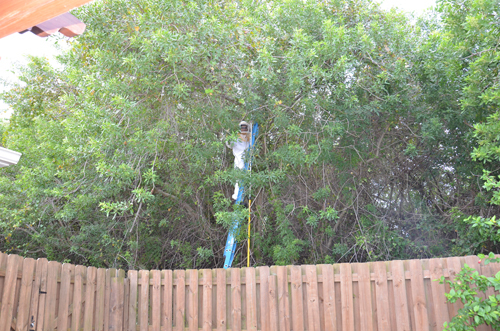 He attached a 5-gallon bucket to the end of a 24 ft telescoping painter’s pole. 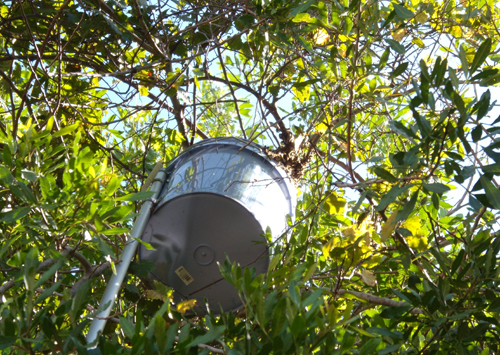 He then positioned the bucket under the ball of bees, gave the branch a good hit and the ball of bees dropped inside the bucket. 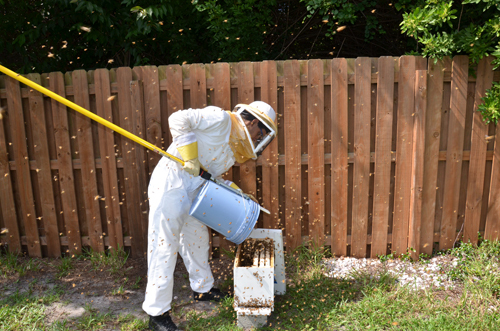 He quickly lowered the bucket and dumped all the bees into a nuc box. 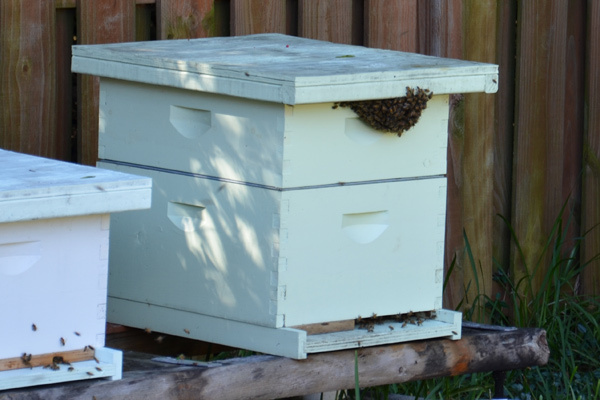 We then combined the swarm back with the original hive. 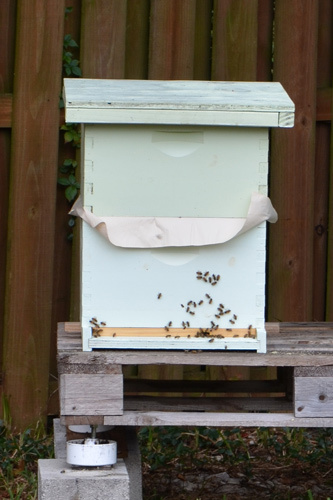 We put newspaper in between the two hives to allow them to gradually merge. 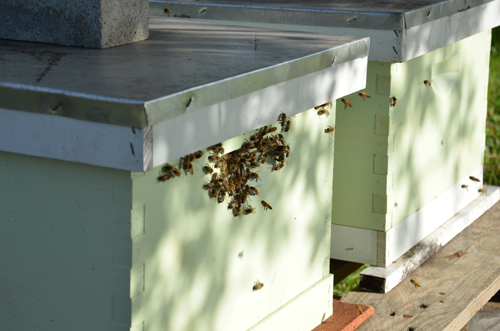 Once the two hives were combined we thought everything was going to be fine and dandy. 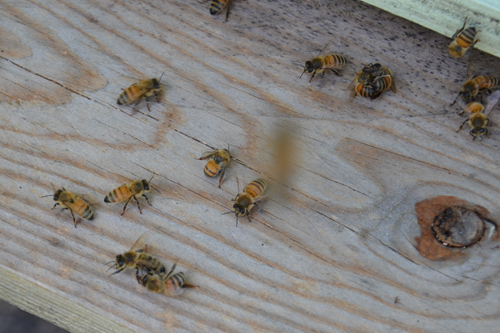 We went to inspect the hive to see what was going on. 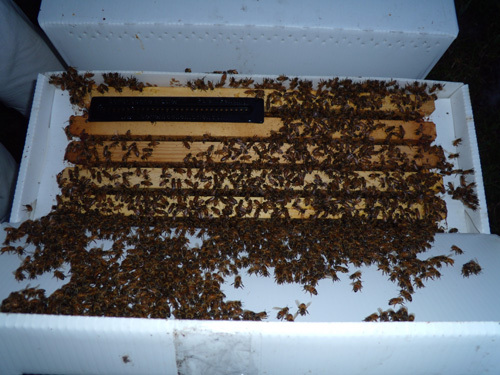 During inspection we found queen cells and our original queen was dead. Not good! 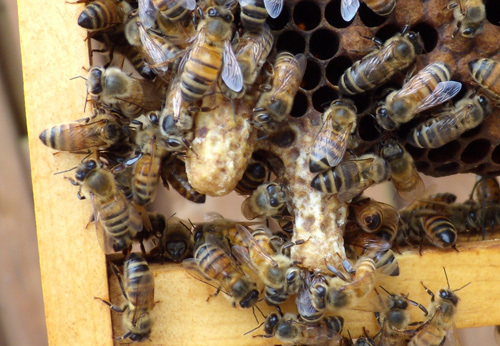 Knowing there were queen cells in the hive that didn’t alarm us too much because we knew there would be a replacement, so we left the hive and the queen cells as is. The hive swarmed again! This time they went up about 30+ ft high into another Brazilian Pepper tree. Because it was so high we needed to figure out a way to reach them, so we left them there for a couple of days. 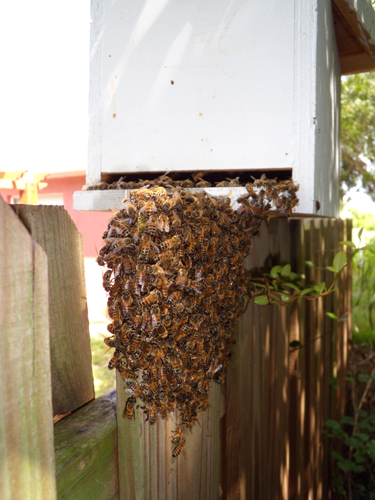 The same hive swarmed a second time!! 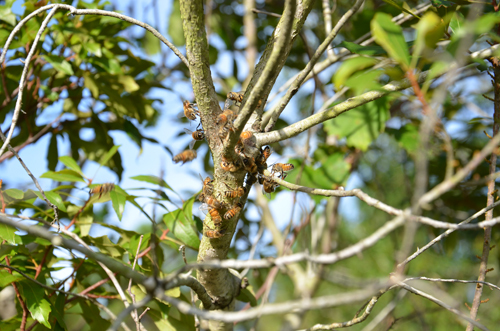 So now we had two separate swarms of bees sitting up in the Brazilian Pepper trees. 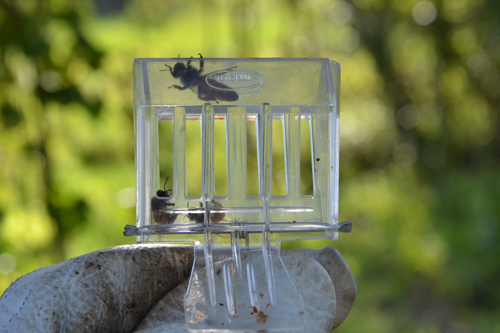 We were successful at catching both swarms and we placed them in nuc boxes. So if these girls thought they were going to get away, they were wrong! 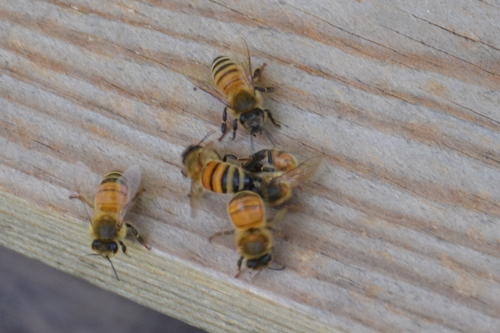 We caught them and maybe now we might have 2 new hives. We’ll see how it goes.